BEN SHE.YI MING. Design [paperback](Chinese Edition). MAYER, Anton (1908-1984):. Ohne Titel [Dolomiten, Rosengarten, Vajolettürme, Südtirol, Italien (Torri del Vajolet, Dolomiti, Catinaccio, Alto Adige, Italia)], ca. 1950. Schwarze Tusche und Bleistift auf weißem Maschinbütten. Vom Künstler r. u. mit schwarzer Tusche monogrammiert ""M A."". Ehrman, Edwina. The Wedding Dress: 300 Years of Bridal Fashions. Banks Pye Roger. Nouveaux Styles d'Intérieurs. From Visual Display Of Quantitative Information, The to Horizon - a Magazine Of the Arts, from	Vienna In the Age Of Schubert to Architectural Digest - December 1998, we can help you find the design books you are looking for. As the world's largest independent marketplace for new, used and rare books, you always get the best in service and value when you buy from Biblio.co.uk, and all of your purchases are backed by our return guarantee. Bang! is the fifth album by Corey Hart, released in 1990. It was his last album to chart in the U.S. , reaching #134, and generated just one hit single, "A Little Love", which reached #37. The track "Ballade for Nien Cheng" was inspired by her novel Life and Death in Shanghai. "Chase the Sun" is a track from his previous album. A hugely entertaining and revealing guide to the history of type that asks, What does your favorite font say about you? Fonts surround us every day, on street signs and buildings, on movie posters and books, and on just about every product we buy. But where do fonts come from, and why do we need so many? Who is responsible for the staid practicality of Times New Roman, the cool anonymity of Arial, or the irritating levity of Comic Sans (and the movement to ban it)? Typefaces are now 560 years old, but we barely knew their names until about twenty years ago when the pull-down font menus on our first computers made us all the gods of type. Beginning in the early days of Gutenberg and ending with the most adventurous digital fonts, Simon Garfield explores the rich history and subtle powers of type. He goes on to investigate a range of modern mysteries, including how Helvetica took over the world, what inspires the seeming ubiquitous use of Trajan on bad movie posters, and exactly why the all-type cover of Men are from Mars, Women are from Venus was so effective. It also examines why the "T" in the Beatles logo is longer than the other letters and how Gotham helped Barack Obama into the White House. A must-have book for the design conscious, Just My Type 's cheeky irreverence will also charm everyone who loved Eats, Shoots & Leaves and Schott's Original Miscellany . 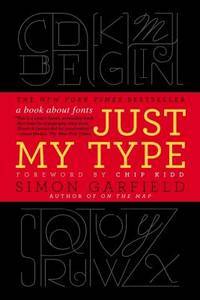 The Elements of Typographic Style is a book by Canadian typographer, poet and translator Robert Bringhurst. Originally published in 1992, it was revised in 1996, 2001 (v2.4), 2002 (v2.5), 2004 (v3.0), 2005 (v3.1), and 2008 (v3.2). A history and guide to typography, it has been praised by Hermann Zapf, who said “I wish to see this book become the Typographers’ Bible. ” Because of its widespread use, it is sometimes abbreviated simply as Bringhurst.